Alignment is the most significant part of good putter that all too many players overlook. Most golfers get obsessed with their putting stroke mechanics and forget to make sure they are properly aligned with their target. On a flat putt, lining up the putter face with the center of the hole is the goal – on a breaking putt, the goal is to make sure your aim matches up with the line that you have chosen. The problem with working on alignment is that it can be difficult to judge how you are doing, so it is often easier to revert to working on mechanics and technique. Through the years, many putters have attempted to make it easier to properly align for your putts – and the Cleveland Smart Square Putter is another in that category. 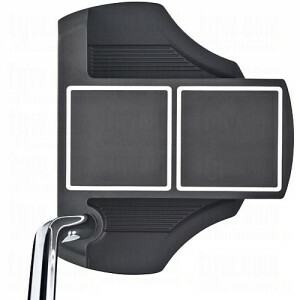 One of the most successful putters of all time – the Odyssey Two-Ball – is a mallet putter that built its popularity on the idea of helping golfers line up their putts more accurately. It features two circles on the top of the putter head that are intended to be lined up with the ball as it rests on the green. In the same vein, the Cleveland Smart Square Putter gives the player two squares that are meant to line up with the ball. Is it easier to line up your putt with squares as opposed to circles? That is for you to decide. Both methods can certainly work – it is up to the individual golfer to decide which look and style they best. Along with the alignment aid that this putter provides, it also offers the qualities that have made mallet putters so popular. Most mallet putters have heavier heads than their blade counterparts, giving the golfer a better feel for the swing as it goes back and through the ball. Mallet putters also resist rotation during the stroke, promoting a straighter path – one that some golfers feel is more repeatable and more reliable under pressure. Not all golfers like the feel and look of a mallet putter – but those who do are likely to appreciate what this Cleveland model brings to the table. Whether the shaft of the putter goes into the center or heel of the putter actually makes a significant difference in how the club plays. Center shafted putters are mainly geared toward players who want to make a ‘straight line’ putting stroke – such as those who putt cross-handed. 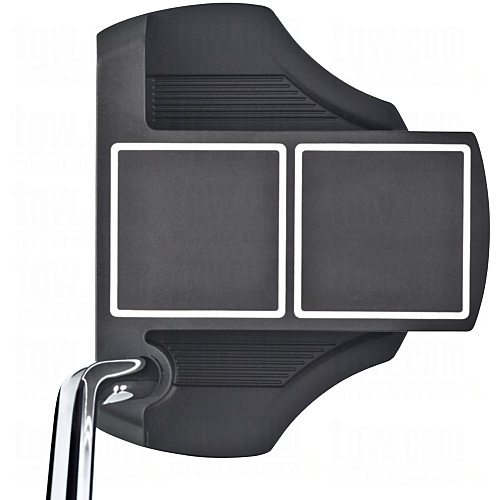 A heel shafted mallet putter kind of walks the line between the two styles. It allows a player to swing the putter on more of an arc, but still gain the stability that a large mallet headed putter offers. Is the two-square alignment method right for you? That is something you will have to decide for yourself. If you feel like you are struggling with your alignment on the putting green, consider giving this square design style a try. There was a time when golf push carts were two-wheeled, rented from the pro shop, and generally not all that convenient to use. Today, however, many golfers own their own carts, which now have three wheels, and are a great option for walking the course without having to lug around a heavy bag. 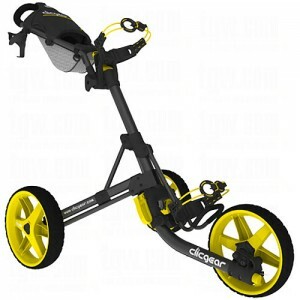 While there are many different brands in the market competing for your push cart business, Clicgear has carved out a large segment of loyal followers thanks to intuitive design, compact folded size, and modern look. Why use a push cart? Walking the golf course is an experience that many players enjoy, but have to give up when they find it too difficult to carry a bag for 18 holes over 4.5 hours or more. Especially for players who like to carry along plenty of extra golf balls, bottles of water, snacks, rain gear, and more, even the best carry bag can start to get heavy. That’s where a push cart can come in handy. Instead of having to rent a power cart and lose the enjoyment of walking the course, you can strap your bag onto a push cart such as the Clicgear 3.5+ and get the best of both worlds. One of the complaints about the early-model three-wheeled push carts were the air-filled tires that had a tendency to go flat at the most inopportune times. Even if they didn’t go flat, the air-filled tires needed to be refilled from time to time, which was a chore that many golfers quickly grew tired of. Most of the newer model carts, including the Clicgear 3.5+, offer solid airless tires which require very little in the way of maintenance. By simply wiping them down at the end of the round, you can keep them clean and will not have to worry about finding an air hose or getting halfway through your round only to find that you are running low in one or more of your tires. Beyond giving you a way to move your bag around the course without throwing it up onto your shoulders, a push cart also adds to your storage capabilities. The Clicgear 3.5+ has a mesh storage bag that is nice for things like a small rain jacket or head covers that aren’t in use. There is also a cup holder for easy access to your water bottle throughout the day. Additionally, an umbrella holder bracket can accept the handle end of the umbrella and keep it in place above your head while you walk up the fairway in the rain. In a way, having a push cart as part of your golf accessories is kind of like having your own personal caddie on the course. If you are looking to add some convenience to your golf game and enjoy walking the course, the Clicgear 3.5+ is a product that deserves your consideration. With a compact folded-up size and easy-to-use design, you will likely soon view your cart as an essential piece of gear.